Whenever users run and launch Windows Explorer or File Explorer (in Windows 10), the GUI shell for Windows operating system, the File Explorer or Windows Explorer will open in default folder which is current user’s “My Documents” (in Windows XP or earlier) or “Documents” (in Windows Vista and Windows 7) or “Favorites” (in Windows 8 and Windows 8.1 or “Quick Access” (in Windows 10). If you’re using another folder as the working folder and need to access different folder which saves most of your files more often, rather than the default location assigned by Microsoft when using File Explorer or Windows Explorer, it’s possible to assign another folder as the default folder so that whenever Windows Explorer or File Explorer is started, it will display the contents of another different folder. Click on Start button, then go to All Programs, and finally Accessories. If you’re using Windows Explorer shortcut at other location, such as Quick Launch bar or Desktop, skip this step. In addition, in Windows 10, you must create a separate shortcut for File Explorer (or explorer.exe) for this trick to work (Properties of File Explorer in Start menu brings you to System Properties instead). To create a shortcut to File Explorer in Windows 10, search for explorer.exe. Then, right click the explorer.exe icon in the search results and select Open file location. 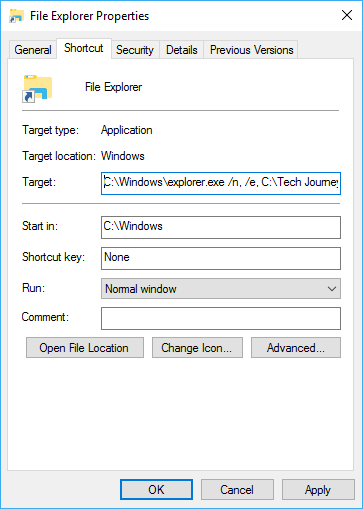 Next, right click on the explorer.exe file and select Create shortcut. Click or tap on Yes to place the shortcut on Desktop. Right-click on Windows Explorer or File Explorer (or its shortcut) and then click Properties. In the Properties window, click on Shortcut tab if you’re not already there. Both of the above is the same, and can be used interchangeably. where <New Path> represents the full path to the new different folder that you want Windows Explorer or File Explorer to open as default folder on launch. The spaces must not be omitted. The above syntax for the Target with “/select” to open parent folder of the destination folder so that you can “select” from all folders (or drives) that are available on the same level of directory structures. The trick works on most Windows operating system, including Windows XP, Windows Vista, Windows 7, Windows 8, Windows 8.1 and Windows 10.